We only got one Fortune Street in the west on consoles in 2011 (there was also one worldwide mobile release), but Japan has been churning them out for nearly every console since 1991. Born out of a Dragon Warrior minigame, this Monopoly-esque series has withstood the test of time, and is set to barrel into Japan later this year on PS4 and Vita under the extremely long moniker of Itadaki Street: Dragon Quest and Final Fantasy 30th Anniversary. 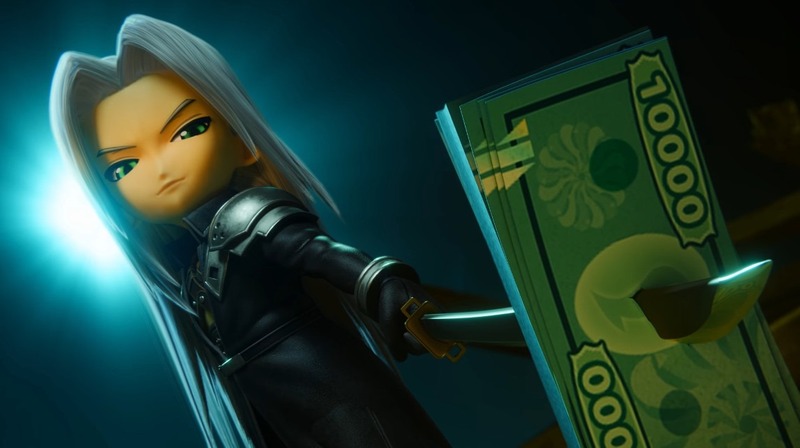 Part of those festivities include an appearance from Cloud and Sephiroth, who are hamming it up in super serious fashion in the trailers below. You'd think that this is the perfect opportunity to drop nostalgia on the west with another localization -- but then again, that's a lot of text to translate I guess!